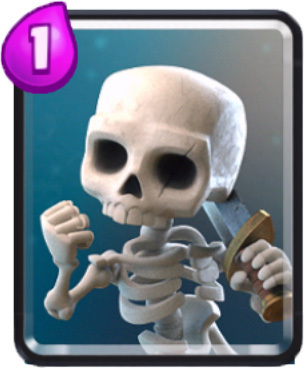 Skeletons card | Clash Royale fan-site! It’s advisable to use: against ground-moving and single-targeting characters such as Mini P.E.K.K.A., Prince, Knight, Giant, etc. For example, three skeletons are able to hold Mini P.E.K.K.A for more than 5 seconds due to its low attacking speed! It is not advisable to use: against all air-moving characters, against characters that are able to attack group targets and against units that attack from the distance (Wizard, Witch, Archers). For example if to put skeletons against the moving Wizard, they would be destroyed before their landing onto arena. If opponent’s Wizard is attacking your tower or other unit – you can throw skeletons and they would destroy him, because Wizard doesn’t switch to another targets until he destroys previous! If Giant Skeleton or Prince is approaching your tower, pose skeletons aside their way. Such action would force enemy to turn and move towards the skeletons what gives more time for the towers for firing in the enemy! The damage power of Skeletons is equal to their health. This is the only card that isn’t capable to cause any damage to the tower in one-on-one standing.